When Anthony Joshua got off the canvas and stopped Wladimir Klitschko on April 29, it didn’t just make him boxing’s best active heavyweight. That performance provided the most memorable moments of Joshua’s career, an unforgettable battle boxing fans will remember fondly for many years. It was the type of career-defining fight Deontay Wilder lacks, according to England’s Joshua. The undefeated IBF/IBO/WBA heavyweight champion explained during a conference call Friday that the reason Wilder has been so forcefully pursuing their title unification fight is because the demonstrative American understands he needs signature victories on his resume. “In a career, it’s all good going undefeated and looking good,” Joshua said. “But when it’s all said and done, how are people gonna remember you? He hasn’t had any memorable fights. There’s nothing I can tell you and say, ‘Oh, do you remember Deontay Wilder’s 29th fight? That was an unbelievable heavyweight fight!’ Do you know what I mean? Joshua reiterated Friday that he’ll fight Wilder at some point in 2018, assuming both boxers continue winning. The 28-year-old Joshua (19-0, 19 KOs) will make a mandatory defense of his IBF championship against Cameroon’s Carlos Takam (35-3-1, 27 KOs) on October 28 at Principality Stadium in Cardiff, Wales. Wilder (38-0, 37 KOs), who will turn 32 on Sunday, is scheduled to make a mandatory defense of his WBC title in a rematch with former champion Bermane Stiverne (25-2-1, 21 KOs) on November 4 at Barclays Center in Brooklyn. 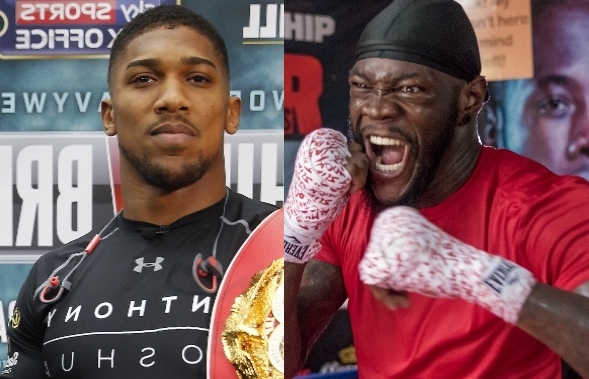 Wilder has repeatedly stated he wants to face Joshua after beating Stiverne again. Joshua understands why Wilder has been so aggressive about pushing their showdown. “All it is with Wilder, I just look at it like this – and these are just conversations that I have with my pals and stuff,” Joshua said. “That guy’s been a professional since 2009. I started boxing in 2008. He’s been professional a year [less] than I’ve been boxing my whole career. So where I’m coming from is that he needs these fights. He wants to kind of – he’s had 38 fights. He’s already on the verge of competing with Floyd Mayweather’s record. Do you know where I’m coming from? He needs these fights. It’s a different ball game. In fairness to him, I think Deontay was trying to set up a big unification and build his name by fighting Ortiz who is a more dangerous opponent than Dillian.